What’s on the menu, you ask? Sammiches — Ice Cream Sandwich, that is. If you’re intrigued by Android and have been wondering what the hype has been about, then consider this an introduction to the latest software version 4.0. There’s a lot to cover, so let’s jump in. What’s With The Name? It Makes Me Hungry. Join the club. Google‘s naming convention has always followed a decidedly foodie path. Whether you’re talking about Cupcake, Donut, Eclair, Froyo, Gingerbread, Honeycomb or the newly official Ice Cream Sandwich, there’s no denying the company wants to evoke the idea of tasty treats with their Android software updates. So does “ICS” (Android v4.0) live up to the moniker? Let’s find out. What’s So Great About Android Anyway? A pal once explained it like this: iOS is for people who want tons of apps and a seamless, polished experience, even if they pay for it with a lot of restrictions or a delay in desired functionality. Android is for users who’d rather have widgets (to see data directly on the homescreen, instead of requiring the user to launch an app first), plenty of customization options, and the latest features available (experimental or no) — and are willing to deal with some bugs to have them. Neither is inherently better or worse; they’re just different approaches that suit different people. What Makes Ice Cream Sandwich So Unique? It’s Google’s first mobile OS that universally works for both tablets and smartphones, is optimized for processors with multiple cores and will be first available on the just-announced Galaxy Nexus. Other handsets will get this version, of course, but its debut offering is only on this Samsung handset (which in and of itself is nothing to sneeze at). Here’s the thing: Android may have a rough-around-the-edges reputation, but this release is gaining a rep for delivering “the most polished Android experience to date.” Ice Cream Sandwich takes some of the best stuff from Honeycomb and puts it together with a reimagined interface. What Else Does ICS Bring to the Party? Attention to Aesthetic Design: Ice Cream Sandwich has enhanced live wallpapers, cute animations and a brand new typeface: Roboto, a system font newly designed for hi-def displays. These are the immediately noticeable ones, but there are tons of changes and enhancements all over the OS. The company kept referring to this as a “magazine”-style design concept, with attractive text and big bold images, and this is reflected in several places, like in the revamped Phone application and People app, with its tiled thumbnails for contacts. Attention to Interface/Input: Sideway swipes and “flick to close” are very present across the board, and Android strives to keep the gestures consistent throughout the platform, for a better user experience. Attention to Features That Users Care About Most: Google didn’t change things just so they could say they made some changes. The company actually seemed to think about its users and what they care about most — from simple touches, like dragging-and-dropping text, to extremely robust data usage management (that can alert you in advance of, or even stop you from, hitting your data cap, not to mention the ability to pinpoint the apps that are killing your usage meter). Even the speech-to-text was tweaked, so that finding and hitting the wee little microphone button on the keyboard is no longer necessary to activate. That’s something sure to make mobile warriors cheer. Homescreen Changes: There are several here. Users can now drop one app on top of another to create an app folder. 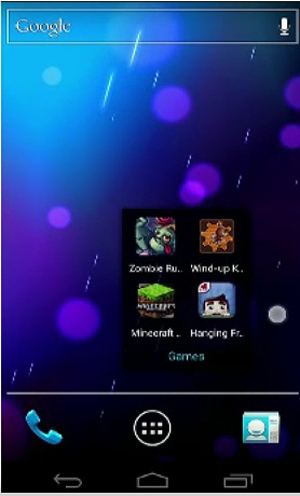 And, because the Galaxy Nexus doesn’t have hardware keys, ICS also made onscreen navigation buttons for Back, Home and Recent Apps available on the display (though they can hide for fullscreen use when, say, video watching). But the biggest change might be the new favorites tray at the bottom of the screen. It’s like a dock that stays put, no matter which homescreen you swipe to — a handy feature for letting users keep certain apps or folders accessible at all times. 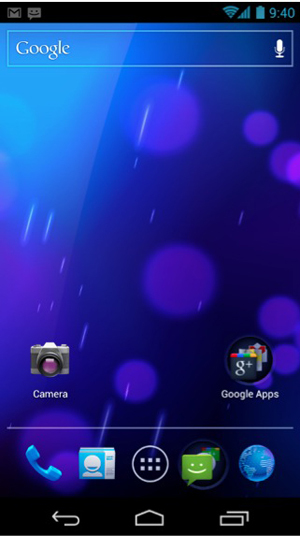 And finally, Ice Cream Sandwich now allows widgets to be resized by just pulling up at the corner. That’s great news for anyone who values homescreen space. Tweaks to Core Apps: The camera function, which is now accessible from the lockscreen, offers an auto-sync feature that uploads images directly to Google+. Once inside the app, there’s a new easy-to-use built-in panorama mode, as well as additional editing and sharing features. The Browser got an overhaul as well, as it now shows tabbed pages in a live thumbnail list that makes it easy to swipe/flick to close tabs. But that’s not all: Want to get off a mobile view of a webpage? No problem. You can view it in full desktop mode, thanks to native user-agent switching. The new People app makes flipping through favorite contacts super enjoyable. The large, tiled images of your contacts are “tappable” so you can see their contact info, as well as how they’re connected to you via social networking. 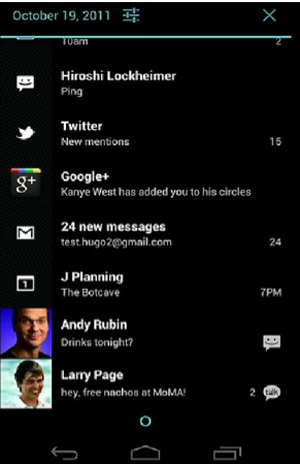 And More: Ice Cream Sandwich also brought some changes to the notifications list, viewable by dragging down from the top of the screen. In the past, users could only clear the whole list, but ICS lets them remove individual items by flicking them right off the list. Notifications also houses some cool new audio controls as well, which allows skipping, rewinding and more. Then there’s the trusty old App Drawer. Users can put their most useful apps and widgets on the homescreen, but the rest are accessible from a separate App Drawer that comes up at the touch of a button. Once inside, they can peruse their applications by swiping sideways (not up and down, like previously). The drawer also hosts a new Widgets tab, keeping these bits of utility within easy grasp, for placing on the homescreen. And finally, ICS brings one-touch multitasking to the party. The Recent Apps button pulls up a list of applications that lets users close individual apps by just flicking them off the list. The Two Splashiest New Features: By now, you may have heard about Face Unlock. In a nutshell, it’s a feature that uses the front camera to view and identify you, theoretically unlocking the device for access. I say theoretically because it didn’t actually work in the demo, and it’s unknown how well this will function in the real world. Still, it’s an intriguing feature, and we can’t wait to see how it performs up close. Then there’s Android Beam. Using Near Field Communication, Android Beam allows users to tap compatible handsets with another to share content. This would make vids, contacts, URLs and more very simple to share with another user in close proximity. This is just a taste of what’s in Ice Cream Sandwich, and there’s even more. (See below.) ICS seems like Google’s answer to all the critics who accused the platform of being unrefined, buggy and not responsive to the user experience. There has been particular attention paid to design, UI and other features that would make a big difference to the experience of any smartphone user. Does everything work perfectly? Well, frankly, that remains to be seen. We don’t have it in the TechnoBuffalo headquarters yet for a hands-on, to know for sure. But on the surface of it, this looks like it could be the best version of Android to date, one that brings a veritable ton of enhancements. So if there was ever a time to try Android, it looks like this would be the version to snag. What do you think so far? 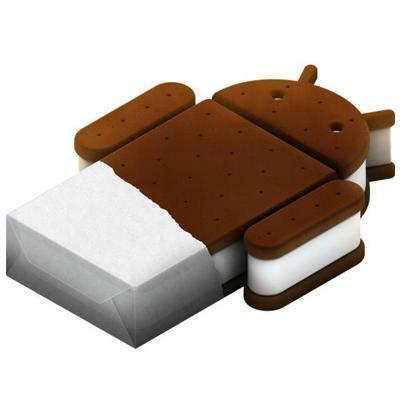 Are you hot to try Ice Cream Sandwich? Let us know how this looks to you in the comments below. As time goes on, we’ll know more about what this new version of the OS will offer. But for now, these are the major features that have been spotlighted thus far. New system typeface: Roboto was designed from scratch for high-definition, paper-density displays, to make text readable and crisp. 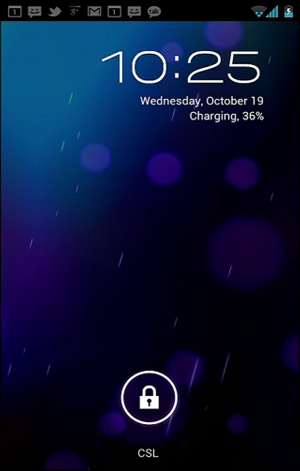 Lockscreen: Users can unlock the device by tapping the encircled lock icon and moving it off to the right. Notifications are also now able to be accessed from the lockscreen by dragging downward from the top. Homescreens: There’s now a customizable favorites tray at the bottom. You can add folders or most-used apps there, or reorder them as you see fit, and they’ll remain at the bottom, no matter which homescreen page you’re on. Also, because the Galaxy Nexus has no hardware buttons or dedicated soft keys, there are new software-driven navigation “buttons” on the display for Back, Home and Recent Apps. They light-up when you tap them, hide when you don’t need them, and rotate according to the orientation. Multitasking: That Recent Apps button along the bottom? Once you tap it, there’s a list of all your recently used applications with big, eye-catching thumbnails. To close, just flick the items off the list individually. App/Widget Drawer: The homescreens allow you to place your most-used apps at your fingertips at all times, but what about the rest? Those can be found in the App Drawer, which has gotten a few tweaks. People now flip through pages of apps with sideways swipes (no longer up and down), and there’s also a new dedicated tab in the drawer that houses all the widgets. Widgets: Google gave this a bit of a makeover, so that they’re nicer to look at and flow smoothly, thanks to scrolling and stacks. They’re also now resizable, which should be a hugely welcome change for users. App Folders: Drag an app over another one, and you’ve got yourself a folder, which can then be named whatever you want. Screen Captures: Just hit the power and volume down buttons to grab a snapshot of the screen and save it to the gallery. Notifications: Contacts pics now show up in the notifications list (accessible by dragging down from the top), and the developers can choose other images to put there beyond the app icon and some text. Items to be flicked off the list to remove, and the list itself is now accessible from the lock screen. It also contains new audio controls, for managing whatever song is playing on the device at the time. Browser Redesigned: New tabbed browser with a scrollable graphical list of tabbed webpages that can each be flicked off the page to close, ability to pull up the full desktop version of a website, ability to automatically sync bookmarks with Chrome on your desktop, save offline pages. New Gmail interface: Now offers two-line previews, a bottom-seated “action bar” with commonly used actions that vary depending on the screen you’re on, swipe to move from message to message, and offline search (for last 30 days of emails). Calendar: Like with other apps, users can swipe side to side to go from one day/week/month to the next. Pinch to zoom in or out, to see more detail. New Data Usage Setting: This amazingly robust usage monitor includes a graphical chart, plus allows users to set a data limit (cutting off mobile data when your threshold is reached), as well as alerts. An extremely handy thing is the ability to drill down and see which apps caused any data spikes in the recent past. If, say, it was a background process causing it, you can even restrict only the background data for this application. Camera: The camera on the Galaxy Nexus is hyped as having zero shutter lag. Given that Ice Cream Sandwich now allows access to the camera from the lockscreen (drag the lock icon to the left, on top of the camera icon), and these users will have practically instantaneous picture-snapping ability, not to mention quick, sequential snaps. Software-wise, there are also many more native editing features, new sharing options and interface, and a built-in panoramic function. And (perhaps as a response to Apple’s iCloud) users can arrange for their images to be uploaded to Google+ automatically. Video Recording: Video capture now offers continuous focus, zoom while recording, support for capturing time lapse footage, and video snapshots. Phone App: This has been completely redesigned, with a stunning new “magaziney”-like aesthetic, with multiple enhancements (like the Quick Response feature, which allows users to see a call come in, and just swipe up to send a prewritten text message to the caller, instead of just letting them go to voice mail). There’s also visual voice mail now within the Phone app, which also includes Google Voice messages natively. People App: The company stresses that this is not just a database of names, numbers and addresses, and indeed, it’s a very attractive application — albeit kind of familiar-looking, if you’re acquainted with WinPho. It uses a tile-like layout with large thumbnail images to house your favorite contacts, and show you all the ways you’re connected to that person. (It culls data from across the social networks to do this.) If your friend updates their info in their accounts, you will receive the update on your device, and you can peruse their recent status updates from within People as well. Face Unlock: Facial recognition here can replace the old trusty pin code or pattern unlock. Okay, so this feature tanked during the presentation, which is kind of embarrassing, but the idea is creative and intriguing. 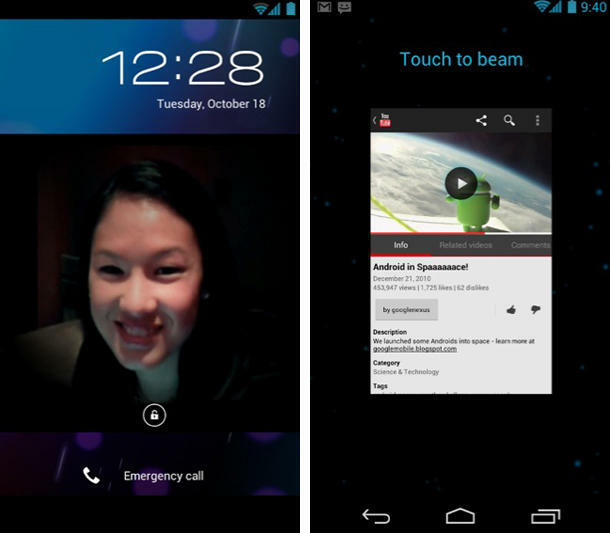 Android Beam: A Near Field Communication–based utility that enables proximity-based interactions. Out of the box, users will be able to tap phones with another Android Beam-enabled device (for now, only another Galaxy Nexus) to share an article, map, contact information, Market app info, YouTube videos and more. And since Google has released an API for this, it may be just a matter of time until multiplayer games, group chat, and other cool uses start to surface. Of course, development will probably accelerate once more handsets support this. Keyboard: Among the enhancements to the keyboard is an improved cut/copy/paste feature, with a spiffy new drag-and-drop function. No more cutting, moving the cursor and pasting, just to relocate a word or two. Speech-to-Text: Looks crazy slick, and not just because of its very decent accuracy. Before, users had to hit the mic button on the keyboard to turn this on. Now, they can just start talking into the phone and it will automatically start transcribing the spoken words.